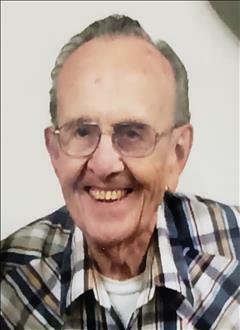 Robert "Bob" J. Derrig, 87 of Fort Dodge, passed away Saturday, February 2, 2019 at the Marian Home. Funeral services will be held on Tuesday, February 5th at 10:00 AM in the Chapel of the Laufersweiler-Sievers Funeral Home and 10:30 AM at Corpus Christi Church with Msgr. Kevin McCoy and Deacon Dan Carney officiating. Burial will be in Memorial Park Cemetery. Visitation will be Monday from 4:00 to 6:00 PM with Rosary prayed at 4:00 PM all at Laufersweiler Funeral Home. Robert is survived by his wife, Patricia Derrig of Fort Dodge; daughter, Candis (Dan) Streit of Fort Dodge; granddaughter, Ashley (Joe) Bohan of Somers; great-grandson, 1 year old Waylon Bohan; and sister, Shirley Musselman of Des Moines; brothers-in-law, Bud Fair of Manson and Frank Rushton of Fort Dodge; sister-in-law, Norene Sorenson of Fort Dodge; several nieces and nephews; his grand-puppies, Finley and Aria. He was preceded in death by his parents, Michael and Hazel (Conlon) Derrig; brothers, Frances, Lawrence, and Duane Derrig; sister, Delores Short; mother and father-in-law, Mike and Nora Rushton. Robert Joseph Derrig was born December 27, 1931 in Fort Dodge. He was raised and educated in Fort Dodge. On February 8, 1951 Robert enlisted in the United States Army and served in the Korean War until February 8, 1953. He was honorably discharged from the Army Reserves on March 18, 1957. On October 12, 1951, Robert was united in marriage to Patricia Rushton. The couple established their home in Fort Dodge. Robert worked as a mechanic for National Gypsum for 47 years until retiring in 1995. He then drove cars for Ford and several other garages. Bob and Pat enjoyed many trips to the Rio Grande Valley in Texas. He was a lifelong member of (Holy Rosary) Holy Trinity Parish.